I have stranger tides and I'm not sure of it! I love it, but my mum said it made my fingers look mouldy, so i don't know! The jacket is gorgeous! Never tried an ear cuff, Always wanted to, but never found one! I love OPI stranger tides - a really unusual colour. Love the purse too! 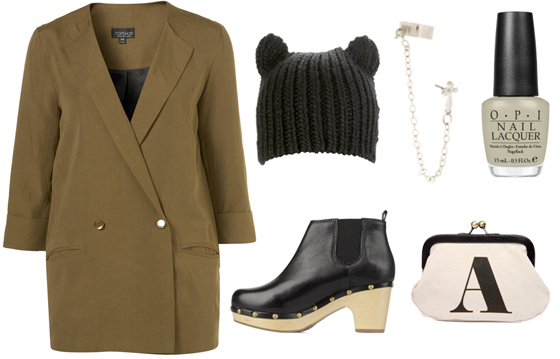 The Topshop ear hat is so darling, and the OPI nail lacquer is such a cool hue. Love the hat! I already have a panda hat that's very similar to that one from two years ago but now find myself making up reasons why I need that one. I have that exact OPI nail polish too, I bought it at Sephora and the lighting in there made it look a slightly differnt colour. It's unusual and I can never decide if I love it or not. I have the ear cuff, it's a lot grundgy'er irl so do be warned if your considering buying, other than that it's really cute and I think it's a nice little statement piece for when your hair's up or if you have shorter hair. Love the jacket and nail laquer!! i bought that ear cuff the other day!! Love OPI stranger tides <3 one of my faves. And that hat is just super cute. i love everything, especially that blazer/jacket i wish you didn't show it haha, it's so expensive! bought that jacket a few weeks ago, definitely worth the money! Great picks especially the hat.